On 28th April 2017, Local TV Station – Notts TV got in touch with professional wedding magician and mind reader, Duncan William, to challenge him to make a major sports prediction. He chose to predict the outcome of the World Heavy Weight Fight between Anthony Joshua and Wladamir Klitchsko. On the 3rd May 2017, Duncan went on to accurately predict the winner, round of defeat and other Bank Holiday sporting events. Predicting sporting events is a rare event to take place and always leaves people asking ‘how?’ and ‘was it a trick or real’? Having been on Notts TV back in 2014, Duncan was invited to use his skills to predict the outcome of some major sporting events over the May Bank Holiday. Accepting the challenge, Duncan decided he would predict 3 of the largest sporting events in the sporting calender to predict. First was the World Heavy Weight fight. This was to be held at Wembley. The competitors were British Fighter and Olympic Medalist – Anthony Joshua. His opponent was the reigning World Heavy Weight Champion, Ukranian Boxer, Wladamir Klitschko. On paper, despite their similar heights and weights, this was something of a David and Goliath fight. Coming into the fight, 41 year old, Klitchsko had defeated the most boxers with an undefeated record. (12) He’d also defeated 10 current or former world champions. He had 68 professional fights and lost 4. 27 year old, Joshua on the other hand had 18 professional fights to his name. All of these were victories by knock out. A previous Olympic champion, Joshua had only been a professional for 4 years. Duncan had also decided to predict 2 other major sporting events. 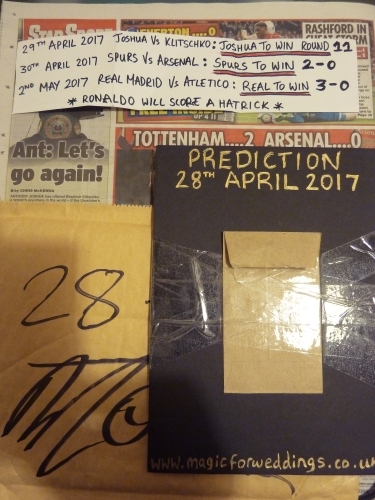 With the World heavyweight fight taking place on the 29th, Duncan would also predict the outcome of the Spurs Vs Arsenal match on the 30th April. The final sports prediction Duncan would make would be the Champions League Semi Final first leg match between local rivals Real Madrid and Atletico Madrid. On 28th April 2017, Duncan appeared on Notts TV and handed over a signed, verified and sealed prediction in an envelope to TV presenter Iain Chambers. He vowed to keep this safe in a drawer so that no-one could open or tamper with the envelope. He kept his promise. The bank holiday came and went. On the 3rd May 2017 Duncan returned to the Notts TV studios armed with nothing more than a pile of newspapers. The envelope was shown sealed, verified and intact. Opening the seal and taking out the prediction. Iain (the presenter) read out load the following. Ronaldo WILL score a hatrick!! All of Duncan’s sports predictions were correct and verified by holding up the newspapers reporting the events the day after. If that wasn’t enough, Duncan then went on to predict what Iain (the presenter) was merely thinking of. Out of any object in the world….Iain was thinking of his arm. “How have you done that?! This studio has never been so silent!” exclaimed Iain Chambers. Duncan is one of the most in-demand wedding magicians and mind-readers in the UK. He performs at weddings, parties and corporate events. He has travels both nationally and internationally, from Nottingham to London, and Japan to America. His act truly is unique. Duncan is often found around the Midlands and London reading minds and leaving guests laughing in amazement as he unlocks their mobile phone, tells them their star sign or tells them their bank PIN number.